There was a pitched battle outside our back door this week. It must have been a scene of carnage and confusion, panic and bloodshed – but the first we knew of it was the enormous body count at our feet when we stepped into the garden. 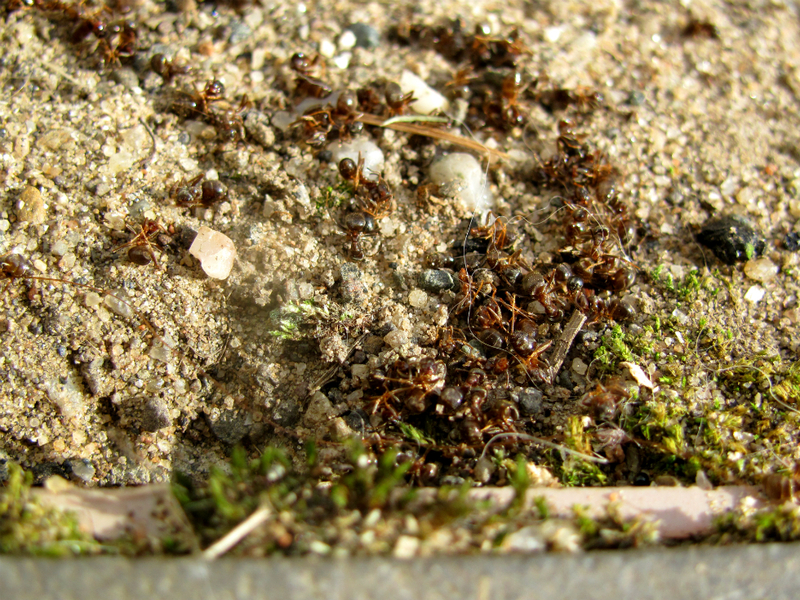 Hundreds of ants lay heaped like plague victims around one of the nests there. Hundreds more were scattered in diminishing numbers across the patio. At first we wondered if the ants had been poisoned. It was some minutes before we were able to identify any ants who were still alive. Part of the reason for this was because they were moving so slowly, and so the eye passed over them without registering them. Once we had noticed one, we began to notice more. There was a mere handful of them, wandering in a dreamlike fashion here and there between the bodies. It would be easy to anthropomorphosise and view them as shocked and exhausted survivors of a disaster. I lay on the ground and examined the scene more closely. I have spent a lot of time crouching over ant colonies, and have come to recognise some of their behaviours. These survivors we saw were not struggling to walk, and showed no sign of the weakness I’d have expected to see in a poisoned colony. Nor were they milling around or relocating their eggs as they would if they felt under attack. Their antennae were tracking the ground ahead of them, and they paused every few seconds over particular pieces of ground. Ants communicate largely by means of pheromones, and they detect these aromas through their antennae. 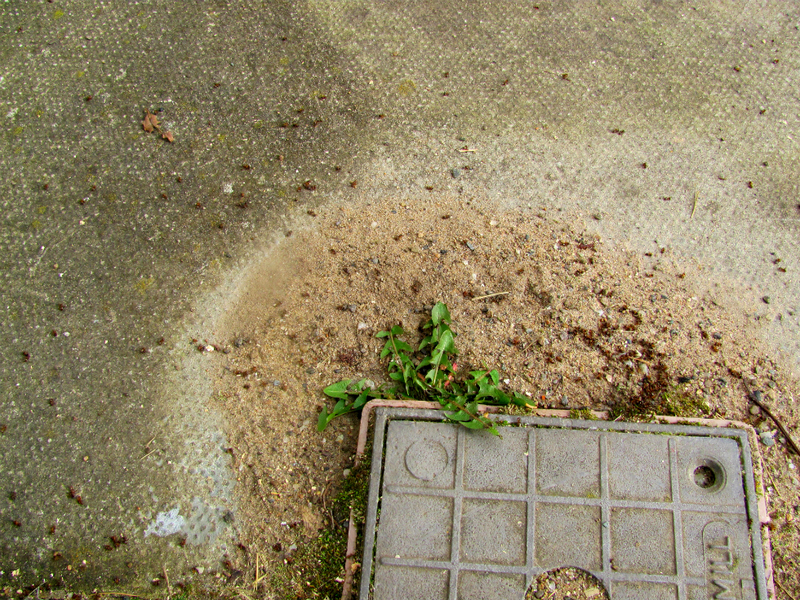 This behaviour is often to be seen when they are foraging, but these ants weren’t moving in the methodical foraging patterns I am used to seeing. This behaviour was more investigative. Bunty, who was watching me watching the ants, noticed one emerging from an underground chamber carrying a dead ant. 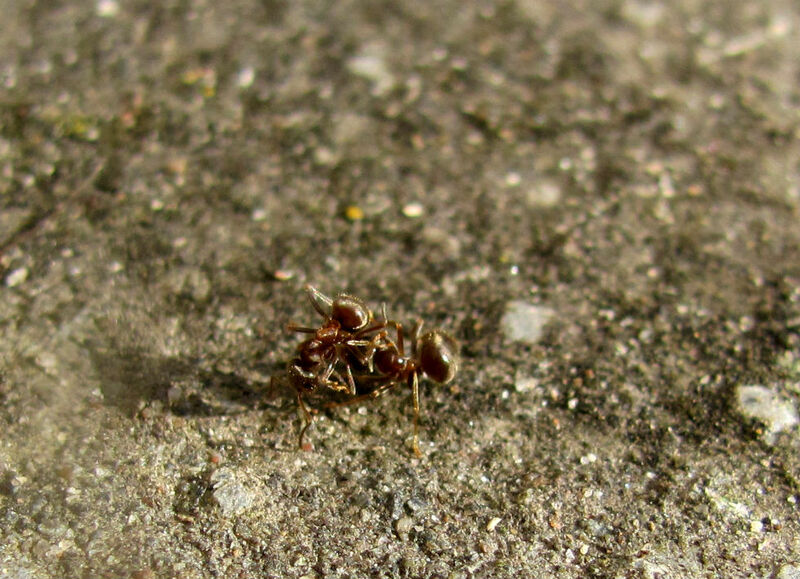 The dead ant was carried some distance from the nest, and dropped on the ground. Other exploring ants ignored this corpse as they ignored the others, and instead continued to follow the invisible tales and signposts written on the ground. Bunty surmised that they might be bringing out their Winter dead. 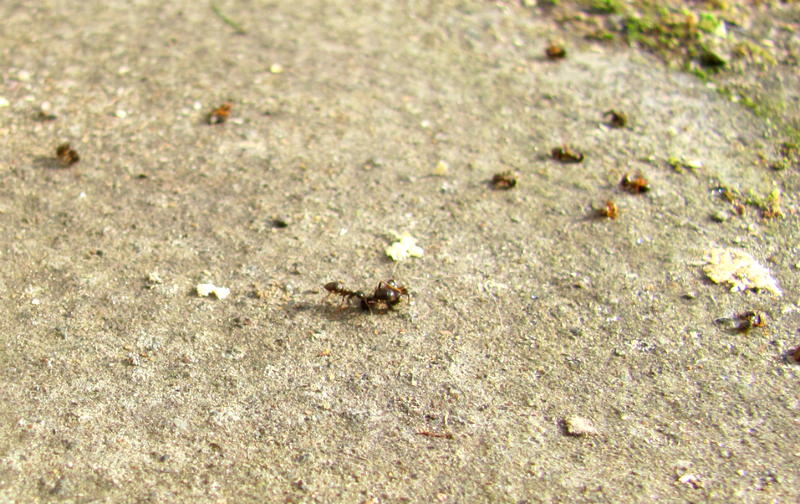 This made a lot of sense to me: the ants have only just emerged from their Winter hibernation. Perhaps they were spring-cleaning the nest. I did think it strange that they weren’t tidying up these corpses by eating them, though. I still wonder about that. Then I noticed that all of the dead ants had ginger-coloured legs, whereas the live ones, the ones I had seen at this nest last year, had dark brown legs. I am not good at differentiating between ant species, especially as some species have different-looking ants to perform different tasks within a single colony. However, it was a reasonable bet that what we were looking at was the late aftermath of a battle between two colonies. This was verified further when I saw a foraging brown-legged ant come across a live ginger-legged ant. They locked together, their feet scrabbling for purchase on the patio tile, their abdomens repeatedly curling toward each other in the acid-spraying attack position. The fight did not end until the brown-legged ant suddenly bit the red-legged one in the thorax, causing it to instantly curl into the insect position of death and paralysis. As with spotting the live ants, once I had seen one fighting pair, my eyes began to register more of them, here and there across the patio. Since the greatest concentration of dead ants was around the nest entrance, I guessed that the red-legged ants had invaded the nest and been repelled, and that the nest inhabitants were now seeking out the final few marauders in order to reduce the possibility of future attacks. Does that sound like a reasonable hypothesis?